Illustrated with line drawings & Photos. 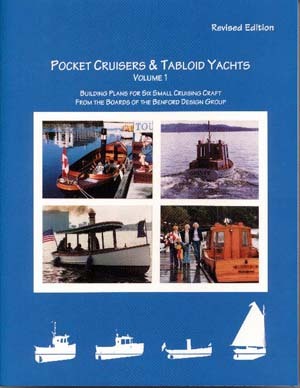 Pocket Cruisers & Tabloid Yachts, Volume I, is a salty collection of complete building plans for six small cruising boats. From the drawings presented, you can build a fantail steam launch (17' or 25'), working tugboat (14' or 20'), supply boat (20'), cruiser (14' or 20'), long distance sailing cruiser (14'), or fantail catboat (20'). One look at these designs and you will know why they have been among the most popular designs offered by Benford. A special effort has been made to reproduce the plans to scale, so that the builder will be able to work easily from the prints in the book. This collection will provide materials not only for the dreamer but for those who are ready to build a boat. This new edition incorporates updates and revisions to the boat plans offered.